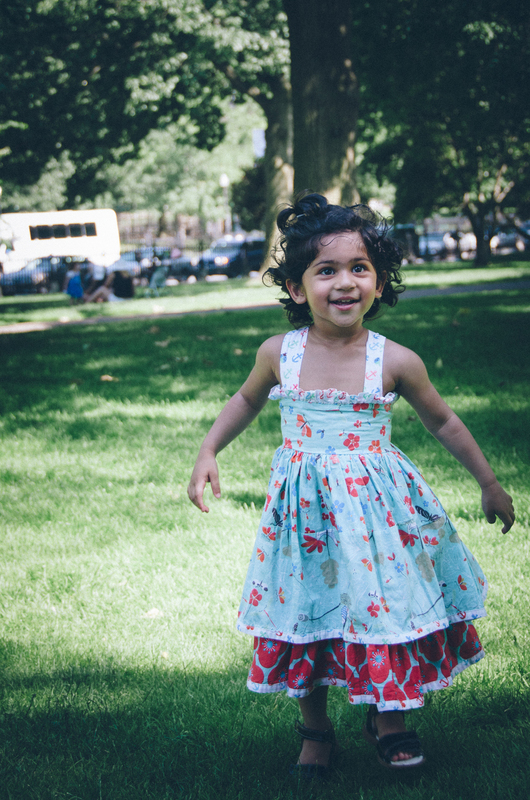 On Monday we were able to hang out with Namita, her husband Krishna and their adorable daughter, Myra at the Boston Public Gardens! The location was an easy one to choose because it is Myra's favorite park and the weather was perfect for dipping our toes in the Frog Pond! We started out by working our way around the beautiful landscape, taking our time to enjoy the flowers and watch the ducks and then crossing over to the Boston Common to cool off in the water. Myra was so cute, although Namita and Krishna mentioned she doesn't love her picture taken lately you can't tell from these shots- we shot it total paparazzi style!!! Her dress, from Red Wagon in Beacon Hill was so cute, I was so jealous it didn't come in adult sizes! When we asked what they enjoyed about their session they said, "Both Christian and Melissa put us and our daughter at ease, right from the first moment to the time we were done. Thank you!". Thank you guys for choosing us to document your family day at the park! We hope you enjoy!